Often, the amount of sugar in the bloodstream is too high or too low. High levels can cause diabetes, and low levels may cause hypoglycemia. The GTF (glucose tolerant factor) complex food molecule is effective at helping insulin balance blood sugar levels, making it useful for depression sufferers and diabetic patients. Glucose tolerant factor is also indicated for carbohydrate metabolism and, because it keeps less sugar from being turned into fat, supporting a healthy weight. Excellent for supporting healthy blood sugar levels, refined diets, a healthy weight & more! Fenugreek Seed,* High Chromium Yeast (100mcg chromium per tablet), Liver (Bovine, Free-range, Grass-fed), Spinach Leaf,* Broccoli Florets,* Cinnamon Bark,* Gymnema Sylvestre Leaf* and Pancreas (Bovine, Free-range, Grass-fed). Inactive Ingredients: Microcrystalline Cellulose, Silica and Croscarmellose Sodium. In addition to the unique properties, synergists and cofactors of this food, each serving provides the following nutrients contained within the above food-nutrient blend (not as isolates): Chromium, Vitamin A, Vitamin B, Vitamin C, Vitamin E, Essential Fatty Acids, Iron, Potassium, Calcium, Magnesium, Manganese, Selenium, Zinc, Phosphorus, Copper, Antioxidants, Bioflavonoids, Trace Mineral Activators, Enzymes, Chlorophyll, Trace Minerals, Amino Acids, Phytoestrogens and more. 2 tablets daily, or as directed by a healthcare practitioner. Best to take before eating. Too often, due to high-carbohydrate and sugary-food consumption, rapidly dropping blood sugar causes cold sweat, rapid heartbeat, blackouts, dizziness and other symptoms as the body tries to balance an assault from sugar intake. Further, glucose tolerance factor (GTF) has been shown to be a major player in the metabolism of fat, especially in overweight people. 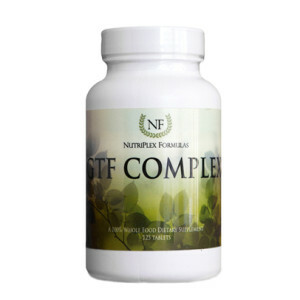 The need for the foods in GTF Complex may be related to a diet in refined foods, especially refined sugars that tend to cause an imbalance in the body’s blood-sugar metabolism (including hyper- and hypoglycemic conditions). This both directly and indirectly places a strain on the hormonal system and pancreas and other organs, including the liver, heart and gallbladder.